I thought I had this zucchini muffin recipe in the bag. 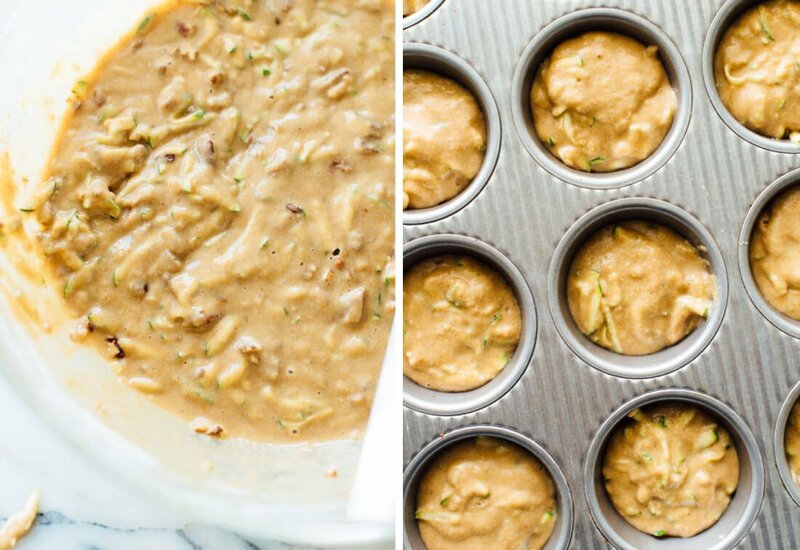 Make my favorite zucchini bread batter, divide into muffin cups, bake for less time—nope. The increased surface area produced slightly dense and dry muffins, which were fine for “healthy” muffins. However, I wanted fluffy, moist and thoroughly delightful muffins that just-so-happened to be healthier. So, I cross-referenced the zucchini bread recipe with my all-time favorite blueberry muffins in my cookbook. I adjusted the leavener, upped the amount of milk and switched to buttermilk for a more tender crumb. Success! These zucchini babes will make everyone happy. Cookbook launch week has been a thrill. I’m overwhelmed, honestly. I’m so excited that you’re excited about the book, flattered by my fellow food bloggers’ kind words, and thankful for friends who took the time to say cheers. All that, and I’m still a little apprehensive about sending my book baby into the world. Is this what it feels like to send a child off on a school bus for the first time? Thank you for your comments, notes and reviews; they mean so much. I hate to ask for more, but if you’ve had a chance to make recipes from the book already, would you mind leaving a review on Amazon to share your experience soon? That might seal the deal for people who aren’t familiar with my blog already. 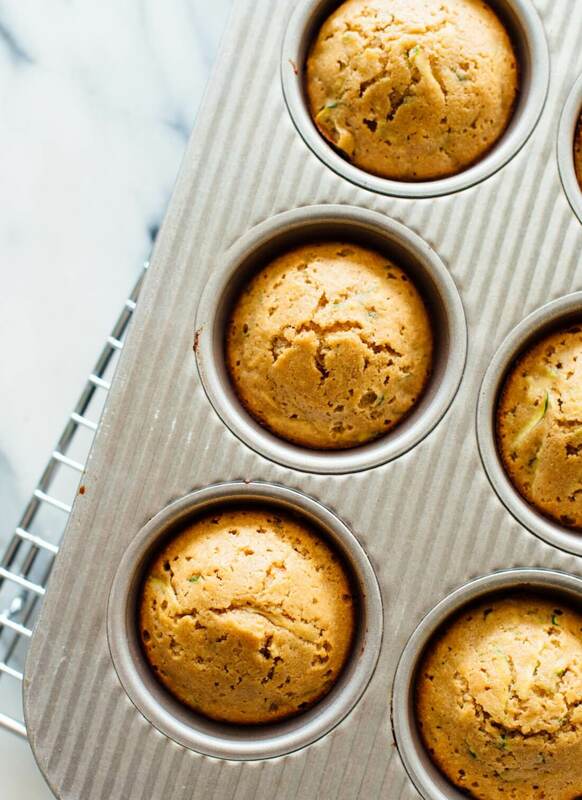 What makes these zucchini muffins healthy? Unlike standard zucchini muffins made with refined all-purpose flour, these are made with white whole wheat flour. That means they’re made entirely with whole grains, but you can’t taste them because white whole wheat flour has such a mild flavor. 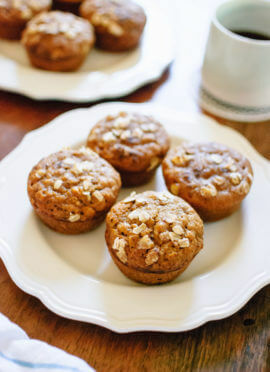 Real maple syrup replaces refined sugar, so these muffins are naturally sweetened. 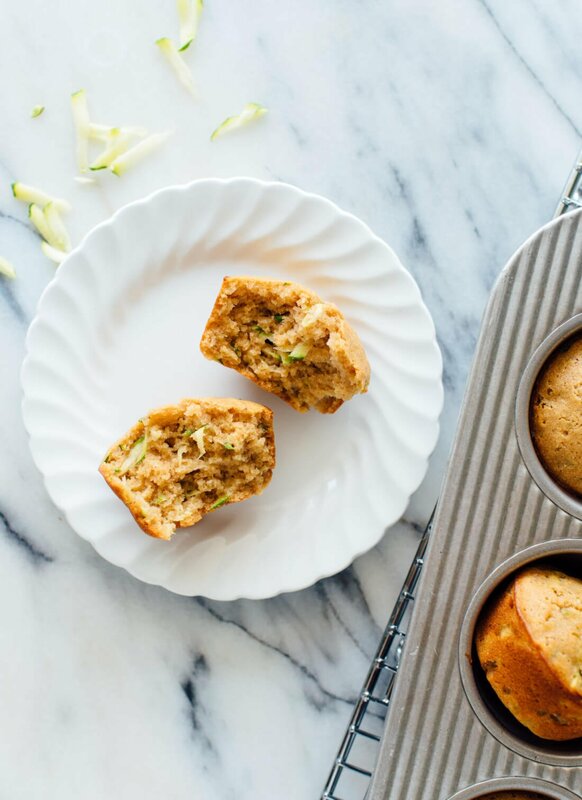 Combined, you end up with hearty and delicious zucchini-flecked muffins. These muffins are easily adapted to vegan and gluten-free diets, too! See my recipe notes for details. Please let me know how they turn out for you in the comments! 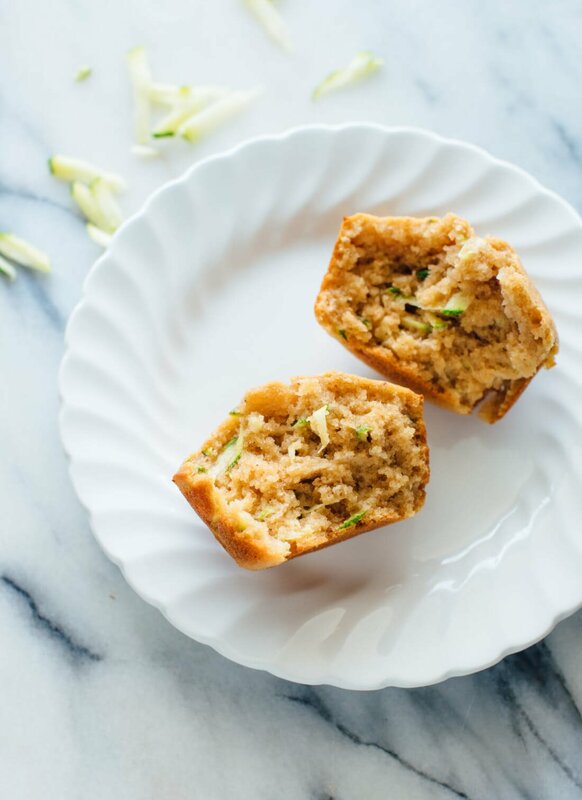 These healthy zucchini muffins are naturally sweetened and made with whole wheat flour! They’re fluffy, moist and absolutely delicious, too. Recipe yields 1 dozen muffins. Preheat oven to 400 degrees Fahrenheit. If necessary, grease all 12 cups on your muffin tin with butter or cooking spray (my pan is non-stick and doesn’t require any grease). Toast the nuts (if using): Once the oven has finished preheating, pour the chopped nuts onto a small, rimmed baking sheet. Bake until the nuts are fragrant and toasted, about 4 to 5 minutes, stirring halfway. Add the buttermilk, cinnamon, baking powder, baking soda, salt, nutmeg and vanilla extract, and whisk to blend. Switch to a big spoon and stir in the zucchini, then add the flour and stir just until combined. A few lumps are ok! Gently fold in the toasted nuts now, if using. Divide the batter evenly between the 12 muffin cups. Bake muffins for 16 to 19 minutes, or until the muffins are golden on top and a toothpick inserted into a muffin comes out clean. Recipe adapted from my zucchini bread and the blueberry maple muffins in my cookbook, Love Real Food. *Oil options: I love coconut oil here. I used unrefined coconut oil and can hardly taste it in the final product. Olive oil might lend an herbal note to the muffins, if you’re into that (I tested with California Olive Ranch’s “Everyday” variety and couldn’t even taste it). Vegetable oil has a neutral flavor, but the average vegetable/canola oil is highly processed, so I recommend using cold-pressed sunflower oil or grapeseed oil if possible. Change it up: Use chocolate chips or small/chopped dried fruit instead of the nuts. Make it vegan: Use maple syrup instead of honey, replace the eggs with flax eggs and choose non-dairy milk, such as almond milk. Make it dairy free: Choose non-dairy milk (I used almond milk). Make it gluten free: Bob’s Red Mill’s all-purpose gluten-free mix works well. Make it nut free: Just omit the nuts, and don’t use nut milk. 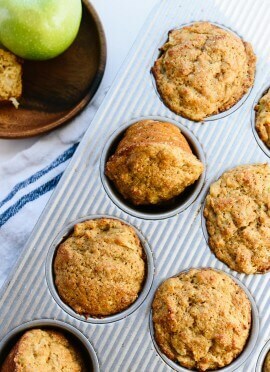 If you love this recipe: You will also love my apple muffins, carrot muffins and banana muffins! My cookbook just arrived. TWO pancake recipes?! And this is in addition to my favorite pancakes from your blog (banana oat). Looking forward to reading it all and trying some recipes this weekend – banana coconut pancakes first! PS…thank you SO MUCH for the tips to make a recipe GF, DF, vegan, etc. it matters so much to me and my family! Hooray! Thanks, Becki. The pancakes in the book are my new favorites. :) I’m glad you appreciate the special diet notes. I want my recipes to work for everyone! These look delicious! Congrats on your cookbook! Thanks, Emily! I hope you get a chance to try them. Congratulations to your husband, Jennifer! What a huge difference. I’m so glad I was able to play a small part in that. Happy that you enjoy the book, too! hi kate, i’m a lacto-vegetarian. in general i haven’t been very lucky replacing eggs with flax eggs. i ordered your cookbook and am waiting anxiously for it. did you try all your egg recipes with flax eggs? how would you describe the difference in this substitution? any tips?? I was just wondering the same thing. My cookbook should arrive today (yay!) and I’ve had mixed results w/flax eggs in the past. My husband is vegan, myself and the kids are not. So I’m planning to try several recipes both ways. I can let you know how they turn out! Hey Monica, flax eggs have worked well for me in recipes that call for regular (gluten-containing) flours. They definitely don’t work in almond flour-based recipes, and certainly won’t work as replacement for eggs in scrambled egg recipes, etc. I came up with egg-free substitutions for all the recipes that I possibly could… I couldn’t find a solution for the blueberry almond cake, for example. For pancakes and waffles, you can usually just omit the eggs and still get good results. Are you using finely ground flaxmeal? Yes! Another commenter said it was a snow day! That’s so insane. We’ve been having a slew of 80-degree days here in KC, so that’s hard to imagine. I’m glad you had the chili to keep you warm! Sending sunshine your way. Fingers crossed that THIS is the year I have a bumper crop of zucchini. If not, there’s always the farm stand! These muffins look great. Got your book Wednesday night, and well, I normally read cookbooks with post-its in hand to flag recipes I want to make, but it would be easier to flag ones I don’t want to make! It all looks AMAZING! Thank you, Amy! Crossing my fingers with you for those zucchinis! You absolutely should go on and on about your cookbook! I’m reading it from page to page like a regular book — I love it. This weekend I’ve lined up a few to make. So far I love the Make-Your-Own Instant Oatmeal Mix. My oatmeal breakfast now tastes like cherry cobbler! I’ll post on Instagram if the photo looks half way decent. these looks absolutely stunning Kate! I always come to you when in doubt of what to bake or cook! thank you for sharing! Hey, Valerie! You can actually make some buttermilk using plant-based milk and some lemon juice. Here’s a recipe from Minimalist Baker that uses the same technique. Let me know how it works out! I rarely make any baked goods but this is a recipe I would definitely want to try out. They look very delicious! I hope you do, Alfredo! I could eat that dip for breakfast, lunch, and dinner! I hope you enjoy the book, especially the pics! Love the cookbook!! I am not on instagram or facebook or whatnot, but I wanted to comment to say it’s awesome!! Made your fettuccine alfredo with spinach and sun-dried tomatoes the day the book arrived and it was so good!! Such a creamy vegan alfredo sauce! Currently drooling over the cashew chai latte recipe but need to go buy more cashews. The book is beautiful! Congratulations!! Your book is beautiful! I bought a copy of it today in Barnes and Noble for an Anniversary gift for my husband (10 years today!). It’s currently on my desk at work so everyone else can peruse through it until I take it home to wrap. We’ve been following your blog for a while – I am vegetarian, he is vegan (I just can’t give up cheese), and our three boys are, by default, mostly vegetarian. You are amazing! Thanks for all the inspiring recipes! Happy anniversary, Julie! I hope your family enjoys the book! Congratulations on your new cookbook!!! I had pre-ordered and was SO excited to receive it on Tuesday. So far, I have made the Fresh Greek Nachos and they were amazing! I served them as dinner along with a fruit salad for my family of four. Everyone loved them. There are few cookbooks that I have read through (and I read through many) that I want to cook so many of the recipes. Yours are very approachable, use readily available ingredients, and look healthy and so delicious. Just the kind of food I want to eat every day. Also, I’m glad we share a love for Mexican flavors and roasted cauliflower! Very best wishes to you and the success of your book!! That sounds like such a delicious, fresh meal, Jessica! I’m so glad you enjoy the book– your kind words mean more than you know. I have the absolute best readers, and you’re a shining example. I just love you and your blog and your cookbook. I can’t wait to get mine! Reading your blog is like reading my best friend’s journal only better because you help me make amazing food for myself, my family and all of our friends. Thank you Kate! Congrats on your super succesful cookbook! So kind of you, Margaret! I hope you love the book. My three year old and I made this for breakfast & they turned out amazing! She loved them and wants to share the with all of her little friends. We added a few mini chocolate chips to the top of each muffin – delicious! We just planted four zucchini plants in our garden (planting season starts late here in Colorado), so I’m looking forward to having a surplus of zucchini in a few months. I’m bookmarking this recipe for later! This is such a cute story, Erin! A great opportunity to spread the love! Crossing my fingers for a great crop of zucchini coming your way. Kate: I love that you offer alternative approaches in your notes. This appeals to everyone…I usually bake with almond meal to make it gluten free, but will definitely try it with the Bob’s AP GF mix. Thank you! Your blog is an inspiration! Yes, I hope you try the Bob’s! I love it. Thanks so much for reading! Thanks for the recipe! I have really been enjoying zucchini in baked goods lately. Yes! Such a good way to sneak in some extra veggies. really good! my son who is sceptical of zucchini loved ’em. I have an issue with sugar/honey/maple syrup so i used half of the honey and chopped up dried dates for the other half. These came out great! Perfect texture, not too sweet so easy! I just made these and they’re great! They’re really moist and have perfect sweetness. I also really like that the recipe is one bowl. Thanks for another great recipe! Thanks, Julie! I love that, too– makes clean-up super easy. Just made these muffins for my co-workers. These were absolutely delicious. I’ve tried taking standard bread mix and turning them into muffins with less than happy results, so I was very happy to see you had made adjustments. Right on point!!! Thanks, Linda! It took a little while, but I got there. I’m so glad everyone like it! Do you have the nutrition for these or did I miss it? Hi, Beth! Unfortunately, I don’t have nutritional info available for my recipes just yet. I’m looking for a solution, and will update about it once I find one. In the meantime, here’s a nutrition calculator that might come in handy. I made these using the coconut oil/honey option (but with white flour because that was what I had on hand) and they were delicious. Even the reluctant kid taste testers ate them. Thanks for a great recipe. Awesome! I’m glad these were kid-approved, Maureen. I hope you got some, too! Have you substituted gluten free flour in this recipe? And did you have to change any of the other ingredients when you used the gf. Hey, Beverly! Great question. I always recommend using Bob’s Red Mill Gluten Free Flour Blend, because it’s a 1:1 substitution with other flours and requires no other substitutions. This was such a delicious recipe. I actually had a half a zuchinni and sweet potato so used a cup of shredded zuchinni and half a cup of shredded sweet potato. I made sure to squeeze access water out of both. It turned out awesome. I think next time I might add some chocolate chips for fun! Thanks for coming up with this healthy and yummy recipe! Awesome! Creative thinking, Nili. I’m glad you loved it! Chocolate chips would be delicious. These muffins are delicious! Just what I needed on my healthy reset day! And thank you for the zucchini tip! To squeeze the water out, I rolled the shredded zucchini in about 5 paper towel sheets and squeezed to keep from having a bunch f shreds on my hands. The zucchini unrolled from the paper towels very easy. As always, your recipes come through right on time! Great! 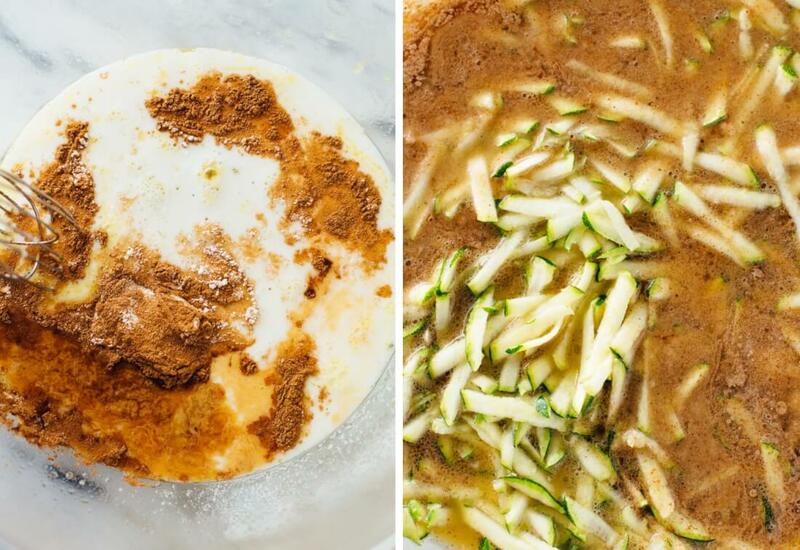 The zucchini tip is essential– prevents it from becoming a gooey mess! I’m glad you loved them, Kecia. Absolutely delicious muffins! I have made many of your different muffin recipes, and they are all delicious. These zucchini muffins were moist, light, and had the perfect balance of sweetness. I also love how healthy they are. I would definitely recommend this recipe! Perfect! I’m so glad you enjoyed these. Until today I ignored that zucchini could be used to bake muffins, you have opened a new window into my gastronomic life. I find this recipe interesting because you are using very healthy ingredients. Which leads me to a question: have you investigated or cooked other recipes without ordinary flour? Thanks for your response. Hi, Amy. Yes, I definitely have! You can find all my gluten free recipes here, sorted by category. If you thumb through those, you’ll find more than a few recipes that use things like almond flour, oat flour, and rice flour. Thanks! These are delicious! I used the coconut oil and honey options, nixed the nuts and added unsweetened coconut, and used 1/2 carrot and 1/2 zucchini. Thanks! Your version sounds delicious, Vanessa. Thanks! Thanks lady big made it. So far looks perfect but havent tried em. Youre so cute love your doggy pic by yours. Thanks, Tiffy! Cookie says hi. :) I hope the muffins came out great! Hi Kate, greetings from the Netherlands! I’m just dropping a line to say thank you for all the delicious recipes you share in your blog! My 3-year-old son LOVES these zucchini muffins (my husband and I love them too!) and I’m looking forward to getting your book soon as a birthday gift. Thanks so much! Hi, Nadia! Thanks so much for commenting–I’m glad your kiddo loves these muffins so much! And I hope you adore the book. Happy early birthday! Words cannot express how much I want everyone to make these :) They are moist and delicious! I used coconut oil and maple syrup. I also made a divine cashew frosting for those days when you just want some on top, and they go perfectly together! :) I’ll be making them breakfasts this week too! Thanks, Kate! Great! I’m so glad the texture turned out so well–no one likes a dry muffin. What’s the nutritional value of these muffins? Calories, fat, sugars, etc? Thanks! Unfortunately, I don’t have nutritional info available for all of my recipes just yet. I’m looking for a solution, and will update about it once I find one. In the meantime, here’s a nutrition calculator that might come in handy. Muffins came out great! Our 2 1/2 year old grandson gobbled them up. I LOVED these, but after about 5 days, they were kind of spongey and oozing liquid. I stored them at room temp in a plastic container. Any idea what happened? I made them w. the olive oil/maple syrup variation. THANKS! Hi, Sally. These are best eaten within a couple days of baking them! I know refrigerating will help to extend the life of them, and they’ll spring back to life if you warm them up for about 30 seconds. thanks! I’m curious what makes them so spongey – – the buttermilk/baking soda combo? Hi Sally, it sounds like the muffins were going bad. Preservative-free baked goods like these will really only last up to maybe four days at room temperature. Storing them in the refrigerator will extend their life by a few days, or in the freezer for a few months. when I click the nutrition information nothing comes up. Could you tell me the approximate calories and protein content for these muffins. made a double batch of these this morning using a combo of honey and maple syrup (didn’t have enough of each), almond milk + ACV, and applesauce in place of the oil. they were AMAZING! This recipe is under vegan recipes, however, calls for eggs, buttermilk, etc. Do you have any vegan baked goods recipes? With chia eggs or other substitutes? Thank you!! Hi Meera, check the recipe notes. :) I have tested vegan substitutions there, which is why I labeled it vegan. If you hover over “all recipes” in the menu, then “special diets” and choose “vegan,” you’ll find more vegan baked goods. Some require some simple subs like this one, so please check the recipe notes for those. I just make the with spelt flour. They are AMAZING!! !congrats on your book!!! Hi, Adele! Sorry to hear about that. Usually this type of result is a baking powder/ baking soda amount mixup. Also, did you make sure to use whole wheat flour instead of something like almond flour or all-purpose? this same issue keeps happening to me as well. I use whole wheat flour and follow the recipe without any alterations, yet it comes out so gooey inside no matter what. Just wondering. I have whole wheat bread flour. Can I use it in place of. thank you! we LOVE this one at our house : ) when i make a double batch (summer’s zucchini abundance), i can get a dozen full size AND three dozen mini. we freeze them and they reheat beautifully, perfect quick breakfast for myself and my toddler. Amazing! I’m so glad this recipe yields so many, and it’s great to hear that they freeze so well. how important is it to use buttermilk? I want to use almond milk, how would I incorporate that? is there something else I need to add like the vinegar or lemon juice? If so, how much? Hi Tecia, you can use any milk. See the ingredients list for details! Thank you for including the gluten-free instructions, I’ve had to make the change in recent months and am still struggling to adapt all of my baking to fit this new need. Thanks for the recipe! I’m a big fan of your banana muffins and make them often. However, I just picked the most GIGANTIC zucchini from the garden yesterday and I’m ready to make (3-4?) batches of your zucchini muffins. Do you think they will be OK in the freezer if I eat through them in the next few months for breakfast? Thanks in advance! HA!! Never-mind. It says right at the end of the recipe that they are good to freeze! Sorry about that! Hi Lauren, I’m sorry, I missed your question until now, and I’m afraid I don’t have a certain answer for you. That might be worth a shot—please let me know if you gave it a try. Adding chocolate chips would definitely work fine. Whoohoo! Finally, a fluffy, delicious and moist ‘healthy’ muffin the family will love. Maybe it’s cheating but I sampled one while still warmmmm! I used a teaspoon of apple cider vinegar mixed in with almond milk to make up the buttermilk and I made up a tablespoon of cinnamon/coconut sugar mixture to sprinkle on top. I’ve got your healthy pumpkin loaf recipe in the oven now and the incredible aroma mixed with the outdoor scene of falling leaves is amazing. Thank you for sharing these scrumptious recipes. Janice, the cook’s right is to sample! Glad to hear you liked it and that you are already trying the Healthy Pumpkin bread. Enjoy! Thanks for an amazing recipe for a healthy snack. 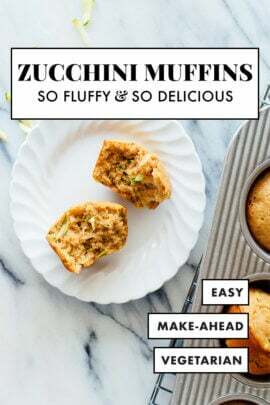 My husband is a fan of zucchini muffins and devoured these guilt free treats. I did however add more spice to the recipe since its fall and holiday season. This is the 3rd recipe I’ve tried from your blog with a pleased toddler and husband. Thanks again and keep sending us these great healthy recipes to keep our families strong! Great to hear all the family is pleased, Pooja! Thank you for the review! I made the zucchini muffins tonight. They are fluffy, moist and pretty but I found them rather bland. I used honey instead of maple syrup since I don’t care for maple; perhaps that would have made a difference. Sorry to hear that you didn’t love these, Kathryn. Did you like them better the next day? Baked goods often develop more flavor after a rest. Thank you Cookie & Kate for this delicious moist & healthy muffin! I did make a few modifications to make it even healthier. I used 1tbsp each of ground chia, flax & wheat germ in place of some of the whole wheat flour needed & they still turned out great! I used Chocolate protein Silk for the milk to give a little chocolate flair & boost of protein too! Wish there was nutritional info though so I could chart my calorie count a little more accurately, but otherwise, 5 stars!! Thank you, Diana for your review! For nutritional information, it is at the bottom of the recipe page under the notes section. Since you made some alterations, you may want to explore some resources to find out more with your adaptions. Thank you, Leigh! I am glad you found one you love. I appreciate the comment and review! This is the best like a hangover breakfast straight. I’ve been making these non-stop this holiday season — love them as a healthy sweet treat that I can feel good about. I use gluten free flour, coconut milk + white vinegar (instead of buttermilk), coconut oil and maple syrup. I also spray the pan with olive oil, which gives it an almost savory taste — next time I make them will try olive oil in the recipe. Thanks for another great recipe! I’m happy to hear that, Tara! Thank you so much for your review. Can I just say…I love each recipe more than the next. I actually made these for my toddler. He gobbles them up. They are so amazing, we are all eating them! I didn’t have nuts so I subbed raisins, but made the recipe verbatim otherwise. Thank you! You are welcome! Thanks for your kind words, Karen. I appreciate your review! I plan on also using this as a base recipe to try with different veggies (for this picky toddler of mine as well as breakfast/snacks full of goodness for the rest of us). I made with all purpose-flour (ran out of whole-wheat), soy milk/vinegar and honey. They have the perfect amount of sweetness and are so fluffy! Adding this recipe to the cookbook! I made these. So delicious. I didn’t have enough zucchini so added some shredded carrot. Love by the whole family, 10 months, 3 years and 2 adults! Even my husband loved it and didn’t realize it was a healthy muffin version. Thanks, Amanda for sharing! I appreciate the star review. Just made these! Over the years I’ve never been able to find a ‘go-to, love every time’ muffin recipe until now! Thank-you!! I made these this morning and they were DELICIOUS! I’m so thrilled to have found a recipe that doesn’t have sugar but is still sweet and delicious. I followed the recipe exactly EXCEPT that I ended up only cooking them for about 9 minutes. Had I gone to 16 they would have been burnt. Maybe just my oven (it’s not the best) but wanted to mention so nobody burns them! So yummy! Thank you! I’m so glad you loved them, Shannon! Thank you for the kind words and review! Love it! Thank you for sharing! I used cashew and a gluten free grain flour and a blend of zucchini, carrots, sweet potatoe, and broccoli for my kiddos and hubby and they turned out great! I love your quick bread recipes and have made several. 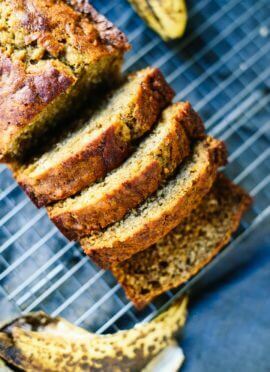 I had a question about the baking soda in the zucchini bread (I do see your adjustment in the muffins) – have you tried baking powder in the bread? Does it work? I am struggling to find where there is enough acid in the bread to allow a reaction with the soda, but it does work and I’m wondering why it does? There is a good amount of soda in the recipe compared with the amount of flour and there is not a whole lot of acidic liquid or other acid, so I am baffled as to why this recipe is so successful (and it is really very good – I do swear by it!) I am considering for the next time I make it that I’ll try souring the milk because the soda should still neutralize the tang and the crumb might be more tender or I might try powder at a ratio that would be appropriate for the flour amount. Since I saw that you had played with the levener and acid in your muffins, I wanted to ask you if you had done this with the bread (in the hope that if you did then I could avoid making a disaster of a recipe that is already really great!). Sorry to be so long winded, lately I am on a quest to understand baking chemistry. This recipe is so good!! Thank you for sharing. Thank you, Amber for sharing! I appreciate it. I tried this yesterday and they were wonderful. Very fluffy which is great. I added about a quarter cup of golden raisins too. And used reg all purp flour as i didn’t have white whole wheat. What I love to hear! I’m so glad they turned out so fluffy for you. Thanks for the review, Andrea. These were yummy. I added melted chocolate to the recipe for chocolate zucchini deliciousness. My kids loved them too. I forgot to squeeze the excess water out of the zucchini so the result was extremely wet in the middle but by the next day, they were perfect. That does sound delicious. If you would want to leave a star review since you liked it so much, I would appreciate it! Hi, I would like to add some mashed banana to these muffins. Can you please guide me on how to do that in terms of quantities? Thanks! I haven’t even made this recipe yet, but I just know it’s going to be delicious! A question, however: In regards to the vegan buttermilk replacement, can any type of vinegar be used (coconut, apple cider, etc. ), or do we have to use normal vinegar? I actually just ended up making it with grass-fed, organic buttermilk, and it was fabulous! Thank you for the clarification, though. Do you sift the flour before measuring? I don’t use a sifter, I typically just spoon the flour into the measuring cup and level off. Very yum. I didn’t have buttermilk but used Lemon juice instead of vinegar and added frozen grated lemon as well. Thank you. Great! Thank you for your review. These turned out perfect! I used whole wheat pastry flour and melted butter because that’s what I had. Not overly sweet, rose up beautifully, fit for company. This was my very first time trying one of your recipes! So happy I found you. The zucchini muffins were delicious! I added a few natural chocolate chips for my picky 15-year old. If I wanted to frost them for a birthday treat, do you think that a cream cheese frosting would go well with them or not? After a very bountiful zucchini season, I now have three batches of these muffins waiting in the freezer for busy days! I’ve made them with olive oil and with coconut oil, and like them either way. I do wring out the shredded zucchini especially well and have added as much as 2 1/2 cups with reasonably good results. Great recipe! Kate … you are a “rock star”. Have to tell you I started using your blog about a year ago and both my husband and I fell in love with it. We found ourselves cooking every day from it. When Xmas came around, I ordered the cookbook – what a fabulous cookbook. You are the Julia Child of vegetarian cooking. Now between the cookbook and your blog, I think we are set for life. I’ve told everyone I know to cook from your blog. Today I made these muffins for about the 5th time and never disappointed. Perfect balance of not-to-sweet with flavour. Your recipes always bring a wonderful balance and I think that’s what we love. Now when friends are nervous about cooking for us vegetarians, I just tell them where the source is for great recipes. Thank you for devoting what must be an amazing amount of time and energy to make this world a better and tastier and healthy place. You are kind, Michelle! I’m glad you like this recipe and blog. I appreciate the review! “Amazon” is not exactly the market-place I would like to deal with as they treat their employees like sh..t – at least here in Europe! I have no idea about what they are doing in the U.S.A. – depending on local law it might be similar! I love your Blog nevertheless – but please be cautious about who you make deals with! I’m sorry to hear you had a poor experience! But, thanks for your support and comment Stefan. These are 5-star muffins for sure! Kate, I so appreciate the care you take in making sure that your recipes are perfect! I’m so glad you think so, Nancy! You’re welcome. I do put in the work, but it’s fun when they are a hit for you! Hey Emily! So sorry for the confusion. I recently edited this post and copied over some bullet points from one of my other muffin recipes, forgetting that this one doesn’t use yogurt. It uses buttermilk instead, and I think you’ll love it. Says yogurt but then there’s no yogurt in the recipe ! Hey Chauncey, so sorry for the confusion! The recipe is correct as written, and there is no yogurt in the recipe. I recently copied over those bullet points from a similar muffin recipe of mine, and forgot that these don’t use yogurt like the other one. I’ve fixed it now. Thank you for bringing my error to my attention! Hi Rena, thank you so much for your support! I really appreciate it, and I’m sorry I missed your comment earlier. I don’t have a mini muffin pan, but generally speaking when changing pan types, you’ll leave the temperature the same and adjust the baking time. I’ve just read online that “With an oven temperature at 350 F or 375 F, most mini muffins need from 10-13 minutes to bake.” So I think these muffins will be done sooner than 10-13 minutes, given that the baking temperature is 400 F. Hope that helps! These muffins are amazing! SO Moist and plenty sweet with half honey and half maple syrup. I added a banana too and used pecans. Love them and will make over and over again. Thanks for the recipe! I’ve made these muffins in mini size twice now in 2 days. Safe to say this is now my go-to muffin for healthier and toddler friendly snacks! Any time I test out a new muffin, I bake a few mini muffins before I bake all the muffins. I would eat them “as is” but I didn’t think my kids would. Maybe because I used 1 and 3/4 cup zucchini, they tasted “like a healthy muffin” according to my husband. I added a little bit of mini chocolate chips and my kids enjoyed them. Hi – these were delicious, I ended up baking a little longer than the recipe called for – added about 5-6 minutes, because they were quite wet (I did wring out the zucchini too), but my children would not eat them due to the presence of a trace of green in the finished product. 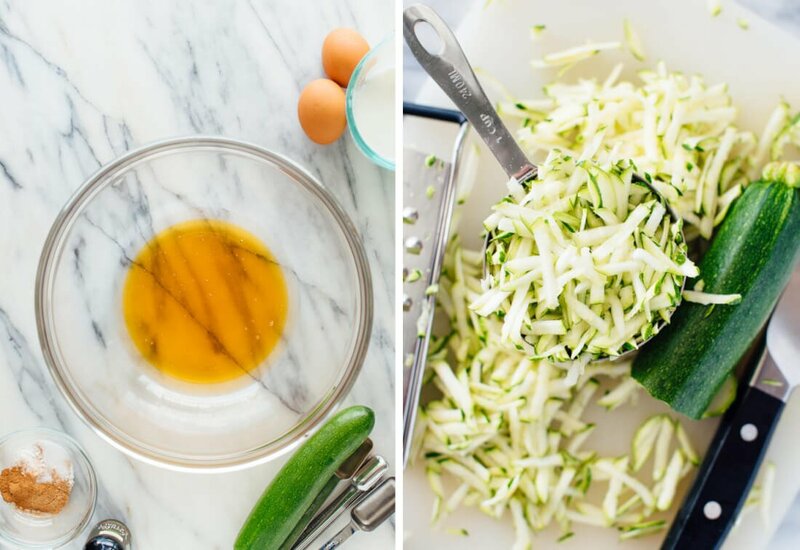 I think I will try this regardless, but wanted your opinion on if you think it would work out to grate and squeeze out the zucchini and then blender it with the wet ingredients to remove those pesky green flecks. Do you think that would make the batter to runny/wet to set up? Hi Jenn! Sorry to hear that these weren’t a hit with your kids. I’m really not sure if that would work, but it might be worth a shot. If the muffin batter is extremely wet, you could gently fold in a couple more tablespoons of flour, and that should help. Made them tonight and 16 mins was too long. Bottom burned and came out dry, but will try again! Still tasted pretty good. Could I omit the maple syrup/honey or use a banana instead? Mashed banana should work pretty well! i wanted to try this recipe, gluten free with almond milk and apple sauce instead of oil. but was wondering if there were any sugar substitutes, could a banana, stevia, swerve or something similar be used? would a banana and apple sauce subs make it too wet? would a granular sugar sub like stevia or swerve make it too dry? With changing all of those elements, I wouldn’t know without testing it. However, I know a lot of other readers have commented about their experience if you wanted to see what they may have tried in the comments. I made these this morning and had just popped them in the oven when I saw my 2/3 cup of DIY buttermilk sitting on the counter!! I pulled the muffins out, and was just putting the batter back in the bowl when my nine year-old wandered in to the kitchen and looked horrified at the situation, not to mention thoroughly disappointed in the zucchini. WELL, she was eating her words (and TWO muffins) when those babies came out!! They were AMAZING. Incredibly moist!! Perfectly sweet (I used maple syrup). Must make again to determine if it was your wonderful recipe or my renegade cooking techniques that infused them with such magic! I love it! Thanks for sharing, Amy.